Prasobchai Kasemsant 2002 36 72/72 7173/7641 60 minutes from downtown. Nestled by the hills and the rainforest of Wangjuntr, in the historically rich province of Rayong, Wangjuntr Golf Park lies quietly in what might be the utmost natural setting of any Thai golf course. Wangjuntr, or the Moon Palace in Thai translation, was once a habitat of the undisturbed natural world, seen only through the eyes of pacifying moonlight, along the road to civilization, however, this tranquil residence of wildlife was gradually encroached and destroyed, leaving the area lifeless. Located just one-and-a-half-hour drive from Bangkok, Wangjuntr Golf Park promises an unrivaled golfing experience without the cost of your convenience, each and every hole that is played here, by professional or amateur golfers alike, merely reflects the scrupulous process that this golf course is built to challenge golfers of all abilities. At Wangjuntr your personal victory here is not based on the score, but rather on the fabulous journey, which simultaneously is the ultimate test of your golf skills, Wangjuntr, a strange sounding name, is located in the hills of Rayong, the Wangjuntr Golf Club features two ‘twin golf course’ layouts each featuring 18 fairways and 36 greens, the same arrangement as many Japan courses, added to this Wangjuntr Golf Park has two of the most challenging and spectacular golf courses in Thailand. 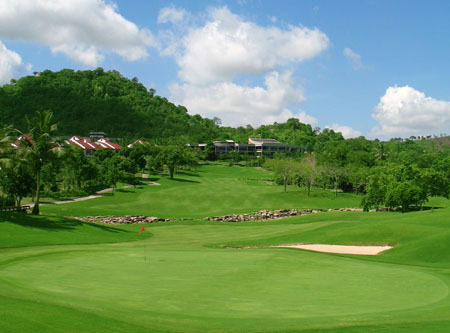 Wangjuntr Golf Park, is best played as part of a Pattaya golf vacation, but also offers several on-site accommodation options including cabins, a golf lodge and a private mansion, all surrounded by greenery and a bird sanctuary, local and international food is offered at the club house.